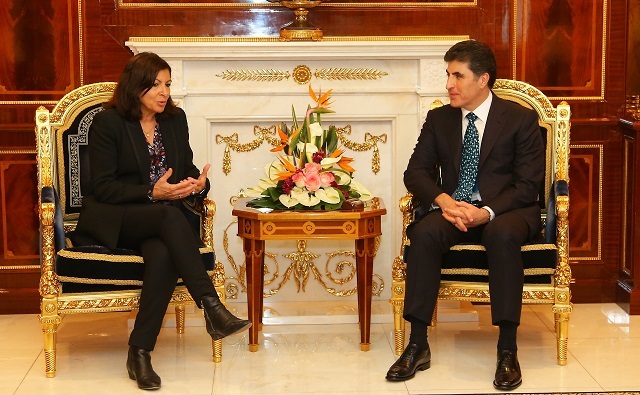 Prime Minister Nechirvan Barzani received Paris Mayor Ms Anne Hidalgo and her accompanying delegation. She commended the people and government of the Kurdistan Region for hosting, accommodating, and providing assistance to a large number of IDPs and refugees and the effective role of Peshmerga forces in the fight against terrorism, thus contributing to the protection of world security. Prime Minister Barzani thanked France and the international community for supporting the Kurdistan Region against ISIS and for the political backing of the Kurdistan Region during the tensions of October 2017. He stressed that, although ISIS has been defeated militarily, the current phase in the fight against terrorism requires the eradication of ISIS ideology. Prime Minister Barzani mentioned the opening of a new Armenian Church in the Kurdistan Region last week in Erbil, which represents a tangible symbol of tolerance and peaceful co-existence of the communities that make up the fabric of the Region. Finally, Prime Minister Barzani stressed that it is time now to work on development, including adoption of clean energy and environmental protection measures.